Audrey Hepburn made her name one of a kind by starring in never forgetting movies like "Breakfast at Tiffany's", "Roman Holiday" and "My Fair Lady". But one film that is often missed by her most dedicated fans is the daunting thriller, "Wait Until Dark". This 1967 film lets you see a different side of Audrey that will make you love and cherish her even more. 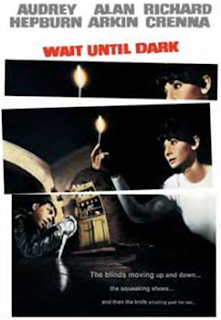 Audrey plays the part of a blind woman that becomes terrorized by three con-men while they search her apartment for a doll stuffed with heroin. Alan Arkin plays a frightening supporting role that you'll never forget. And if that's not enough to scare you, the minimalistic hair-raising music will do the trick! Add this to your October list of must see films to get you into the Halloween spirit. I recall this being somewhat of a go-to for the braver of you among us at sleep-overs.